Blendy Pens™ are the ONLY pens that work just like regular markers but can also be fused together to create over 276 amazing color combinations! Shading, colors and realistic backgrounds come to life in front of your eyes each time you dive into a box of Blendy Pens™. How to Create Color Fusion! Choose two Blendy Pen™ colors and put the tips facing each other into the Color Fusion Chamber. 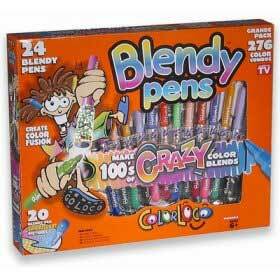 Make sure you push the Blendy Pens™ all the way into the Color Fusion Chamber. Hold the joined Blendy Pens™ in a vertical position with a firm grip. Twist and hold each pen in the opposite direction to each other for 5 seconds. The longer you hold the more intense the color fusion.